Today I am finally going to sucumb and make a banana cake. Honestly, it tastes just like a Sara Lee. I am having to fix beef AGAIN for dinner so I want something I like. Later in the week I intend so soak some chicken breasts in a teriyaki sauce and tell him it is beef. I don't think he will know the difference. The banana cake turned out well. I use a convection oven here and sometimes I have trouble with the timing when I am baking. And to make matters worse the oven door is tinted brown so I got my cake a bit brown but a nice inch layer of frosting hid that little prob. 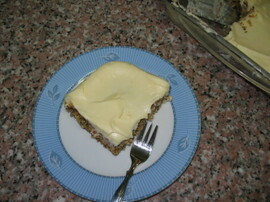 Here is my recipe for banana cake, it is easy. 3 eggs and mix well. Repeat two more times. Keep mixer speed on low. 1 teaspoon vanilla or 1 teaspoon banana extract or both. 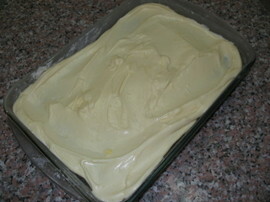 Grease and flour a 9 x 13 pyrex dish or 2 9'round cake pans. Pour in the batter and bake at 350 for about 20 minutes. Baking time will vary depending on your oven. Please check after 20 minutes and adjust the time. 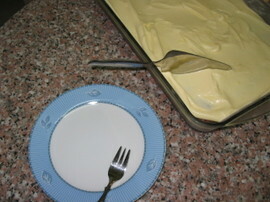 Cake in done when it springs back when pressed lightly with a finger or when a toothpick comes out of the middle clean. Beat together until spreading consistency is to your liking, about 5 minutes. I am going to try this for Memorial Day Weekend. Sorry you will miss the plant swap.